Mule Day is coming up March 27 – April 2! 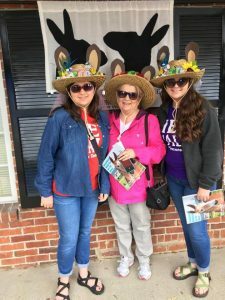 For those of you who did not grow up in Maury County, TN, Mule Day is an annual celebration of all things mule. Columbia, TN is the “Mule Capital”of the world and the gathering place of a fun four-day event that attracts over 100,000 people. In addition to our long-eared friends you will find traditional southern food, music, dancing and crafts. At Maury County Park there are many competitions during the week such as a mini mule show, old fashioned log pulling and stick mule rodeos. On Saturday there is a fantastic parade that winds its way through downtown Columbia. While you are here there is so much to do including unique shopping (where you can find the perfect mule souvenir!) and fun local restaurants. The downtown square will have live music and you will experience the warm, southern hospitality the area is known for. We hope you will join us for Mule Day in Columbia, TN!